31 December - last day of the year, and this calls for a throwback!!! 2017 was like a roller coaster ride, packed with sweet and sour moments. From working on some fabulous projects, to interacting with incredible artists. Exploring beautiful cities and countries to watching my Dancebee Fam grow by leaps and bounds, with fans from across the globe; undoubtedly, there was a lot to be thankful for. It was also the year that taught me a lot about life and it's unpredictability. While the professional front saw a lot of hope and full fledged action, I dealt against a lot of negative vibes on the personal side. The last quarter of 2017 was like a ridiculous nightmare, with strange and depressing things happening one after another. With god's grace and faith in that 'light at the end of a dark tunnel', we have managed to divert our attention towards bigger things and look at the brighter side of life. The tide is still very much high, but we hope the new year shall sail things smoothly. The end of November as a big blow. My darling little babe - Kiara's loss left a big void. It wasn't easy to cope up with all that had happened. But, I somehow mustered up the courage and realised that she is very much with us. Her warmth, kindness and happy face will always have an integral space in my heart. She is watching us from the heaven above, and will continue to spread happiness across the rainbow. 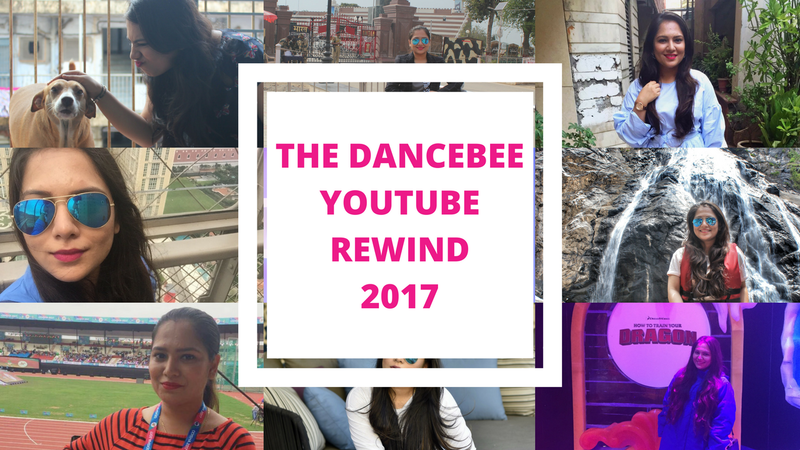 All said and done, it's time to take a look at the year that was, with our very own - Dancebee Rewind 2017! Watch the video, and do leave a comment / Hit like if you enjoyed watching little glimpses from my life. As we inch towards a brand new year, here's hoping it brings in lots of positivity, love, hope and happiness across the globe. And of course, I promise to create tons of new content (also, to be a LOT more regular on YouTube. I promise) and shall continue to take our content a notch higher than the last year, as always. Here's to raising the bar in 2k18 with our work and enthusiasm, and spreading positive vibes around like a pocketful of glitter. Goodbye 2017! See you in 2018, Dancebee Fam. Here's wishing everyone a brilliant NYE.